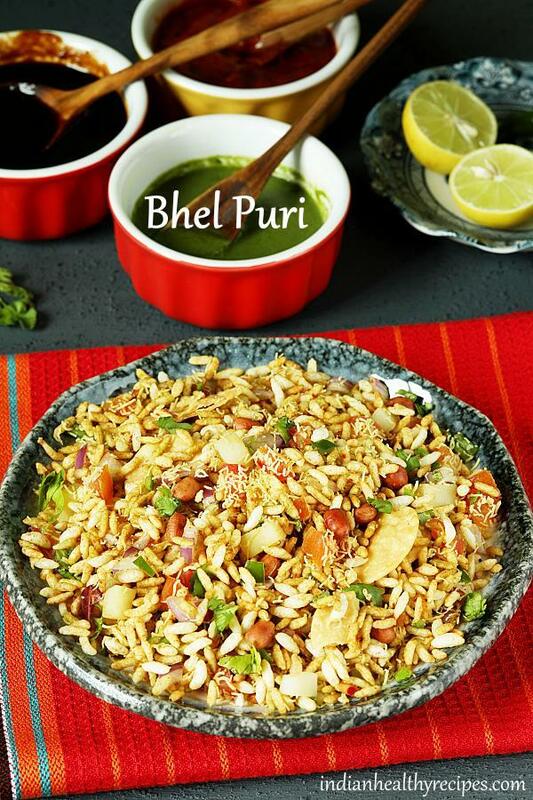 Bhel puri is a slightly sweet, spicy & sour tasting chaat snack made with puffed rice, chaat chutneys, veggies & Sev. It is a very popular street food & is mostly loved by everyone. Bhel puri is said to have originated in Mumbai & became one of the most loved chaat snacks across India. It is a low calorie snack that is addictive, tastes delicious & is flavored packed. Bhel puri is most commonly sold by the street vendors on the push carts. It is also served in the North Indian restaurants & Chaat centers. 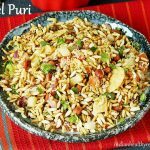 In this post I have shared in detail How to make bhel puri along with the preparation of chaat chutneys required for the recipe. If you are new to Indian foods, then these FAQs may help you to know more. Bhel puri is a popular Indian street food made with puffed rice, peanuts, chutneys, spice powders, veggies & sev. There are 2 kinds of bhel puri made. One is the wet & the other is the dry one which is known a sukha bhel. The only difference is the dry or sukha bhel is made without chutneys. So if you are unable to make the chutney then you can still make the dry bhel. 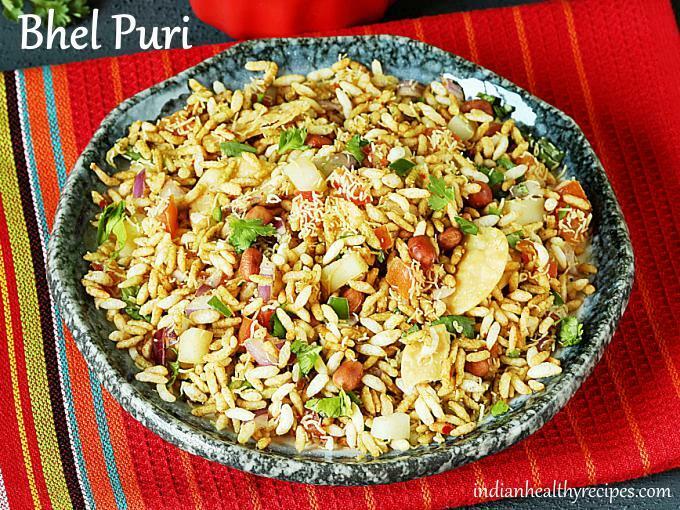 Jhaal muri and churumuri are two similar snacks & are also very popular in other regions of India. Bhel puri is so well known that it is sold every where across the streets of India. 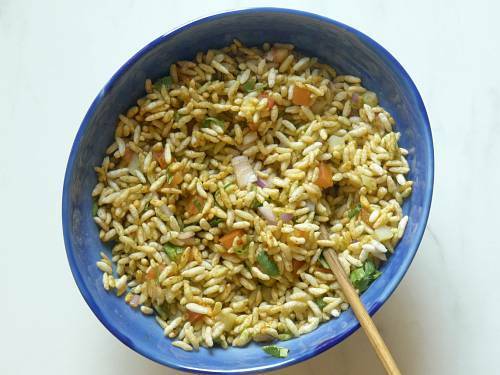 A basic bhel puri can be made with puffed rice, roasted peanuts, sev or mixture, onions, tomatoes, chaat masala, lemon juice, salt & coriander leaves. But to make a flavor packed bhel puri chaat, 3 kinds of flavorful chutneys are the key. Tamarind chutney, green chutney and red chutney are the much needed to elevate the flavors & taste of this snack. Most often tamarind chutney & green chutney are used and the red chutney is just substituted with red chili powder. However bhel puri made with red chutney is much superior in taste & flavor. We at home prefer the flavor of red chutney in bhel puri so I always make it using all the 3 kinds of chutneys. So for convenience you can very well, make all the chutneys ahead and refrigerate. The recipe of chaat chutneys has been shared below after the recipe card. For detailed step wise versions of the same you can check these posts on Tamarind chutney and Green chutney. Next roast the peanuts and store them in a air tight jar to retain the crunch. You can buy the puffed rice, papdis & sev from the Indian grocery stores just like the way I did. Locally made sev & papdis smell & taste fresh. Just before you begin to make the bhel puri, chop the potato to half inch cubes. Boil them with water in a small pot. Meanwhile chop the onions, tomatoes, coriander leaves & green chilies. 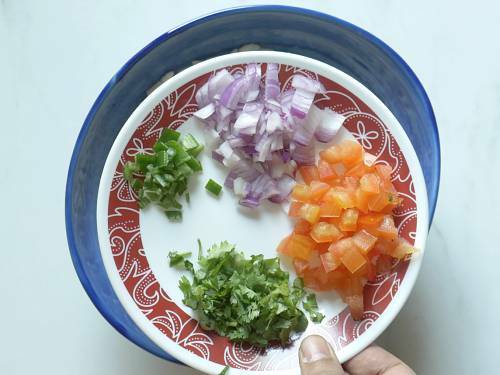 Once the above preparation is done, you will finish making bhel puri under 5 mins. More details mentioned in the recipe card below. 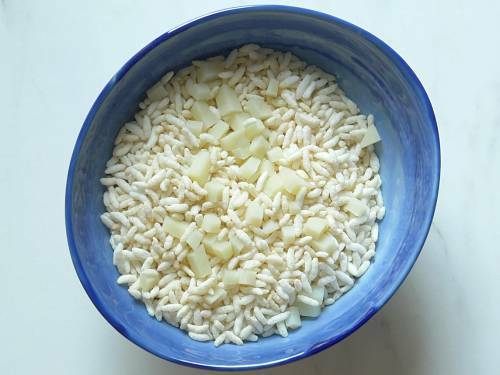 Firstly ensure puffed rice is crisp if not roast them until crisp. Cool completely before using. Secondly keep the consistency of the chutneys thick & not runny. This prevents the bhel puri from turning soggy too quickly. Lastly do not add too much chutney at one time. Add a bit mix and then add more only as needed until you get the taste you desire. Always add the crispies – sev, peanuts & papdis towards the end. Bhel puri is a popular Indian street food made with puffed rice, peanuts, chaat chutneys, onions, tomatoes & sev. If your puffed rice is not crisp then dry roast them in a pan until crisp. Cool completely. Add them to a mixing bowl along with boiled potatoes, onions, tomatoes, chilies & coriander leaves. Mix them up gently. Then add in tamrind chutney, green chutney, chaat masala & chilli powder. Gently mix well to coat then puffed rice with chutney. Taste this and add in more chutney & salt as needed. Crush the papdis and add them along with peanuts and sev. Give a good stir. 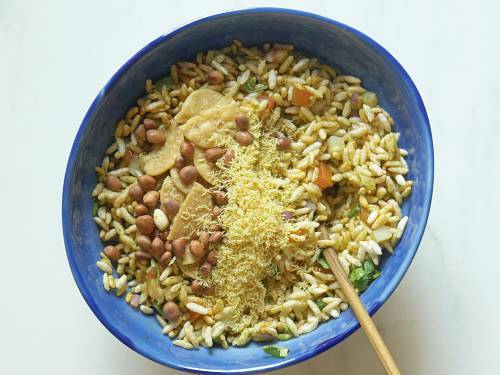 Garnish bhel puri with more sev and peanuts. Serve immediately. You can find the recipe for chaat chutneys after the recipe card below. Tamarind chutney: soak 3 tbsps tamarind in ½ cup hot water. Add 4 tbsps jaggery and rest for a while.Squeeze the tamarind pulp and pass through a strainer. Add ¼ tsp red chili powder, ¼ tsp salt, ½ tsp jeera powder, ½ tsp coriander powder & 1 pinch of ginger powder. Taste and add more salt or jaggery if needed. Mix & boil this until thick. Cool & use it. Green chutney : blend together ¾ cup coriander leaves, ¼ cup mint leaves,1 green chili, ¼ inch ginger, 2 pinches salt, ½ tsp jeera powder, 1 tbsp fried gram, 2 tsps lemon juice & 2 tbsp water. Red chutney : soak 20 red chilies in half cup water. Remove and blend them with 2 to 3 tbsp water, 8 to 10 garlic cloves, 1½ tsp sugar, salt & ½ tsp jeera. Adjust salt, chili & lime juice in all of the chutneys. 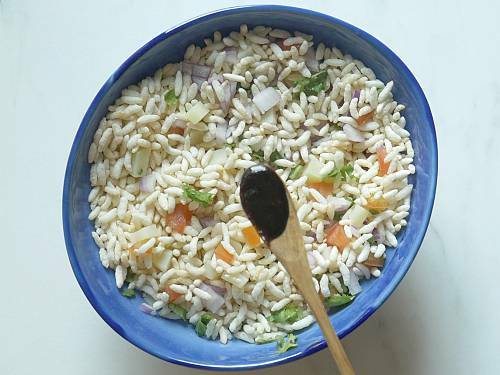 1.I usually cut open a fresh pack of puffed rice when I make chaat recipes bhel puri, churumuri or jhaal muri. If the puffed rice is not crispy then dry roast them until crisp. Cool and then add them to a mixing bowl. 2. Add the boiled potatoes. I cube the potato and boil in 2 cups of water until just cooked. Drained the water and cooled completely. Potatoes must be dry and not moist. Then added them here. 3. Then add in onions, tomatoes, coriander leaves & green chilies. 4. Toss them well. Then add tamarind chutney. I begin with a small quantity of chutneys as you cannot undo if it becomes too sour or sweet. I also feel too much chutneys or too thin chutneys will make the bhel too soggy very quickly. So add them as needed after tasting. 5. Add red chutney. If you do not have red chutney just replace with some chilli powder. 6. Next add in green chutney. 7. Mix to coat the chutneys all over the puffed rice. I added more of all the chutneys. Sprinkle chaat masala and salt if needed. 8. Add roasted peanuts, crushed papdis & sev. Gently mix. Transfer bhel puri immediately to serving plates. Top with more sev and papdis. you are welcome. Thanks for trying. Yes I can share nawabi chicken and naan. The tamarind chutney and red chilli chutney will be good enough to make about 8 servings of bhel puri. I am not sure about the green chutney if it would be enough. So Please follow the link to green chutney to make a bit more. You can find it in the recipe card.